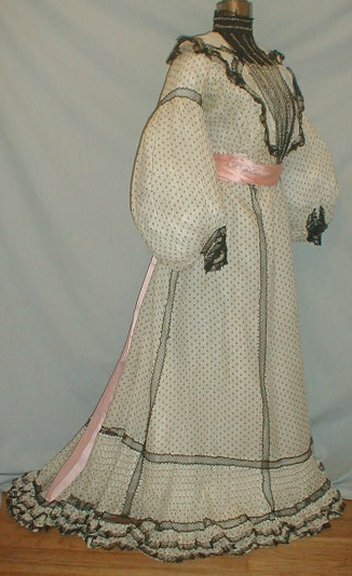 An enchanting 1890’s white cotton two piece dress. The fabric has a black circle pattern. The bodice and skirt extensively trimmed with inserts of black lace. 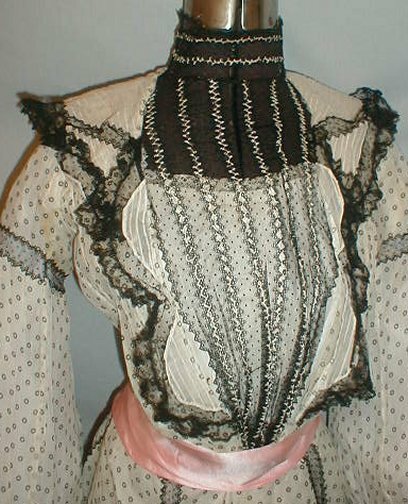 The bodice has a black lace high neck insert. The wide lapels are made of white cotton that has rows of thin pin tucking. The sleeves are designed in the inverted leg of mutton style. 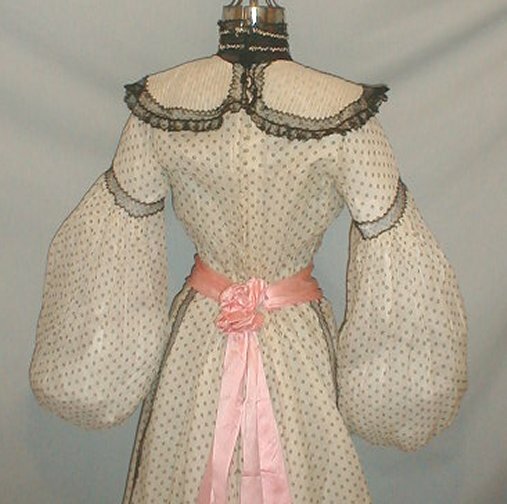 The bodice is lined with cotton. The lining has a hook and eye closure and the outer cotton fabric has a small Dorset button closure. 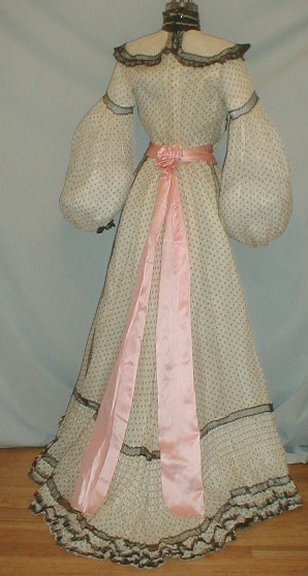 The skirt waist is trimmed with a pink silk bow and long streamers. The skirt is lined with cotton. The dress is in very good and sturdy condition. There is some mild soiling under both arms that does not show when displayed. Bust 34 Waist 24 Front skirt length 40 back length 45. I'm thinking this one might be early 1900s- look at the s-curve shape and the beginning of a pidgeon-breast look. 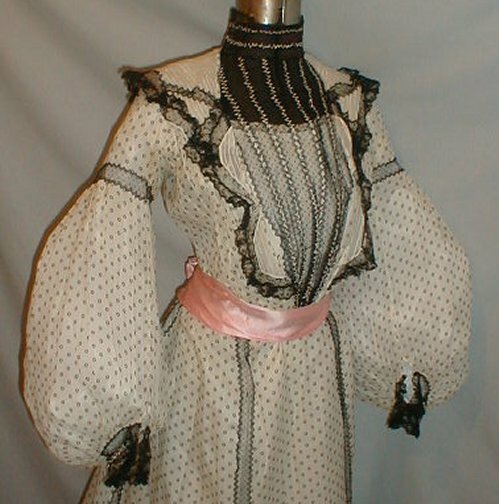 There is a little 1890s throwback with open-vest look of the front, but I'd say the sleeves are pretty 1900s too. 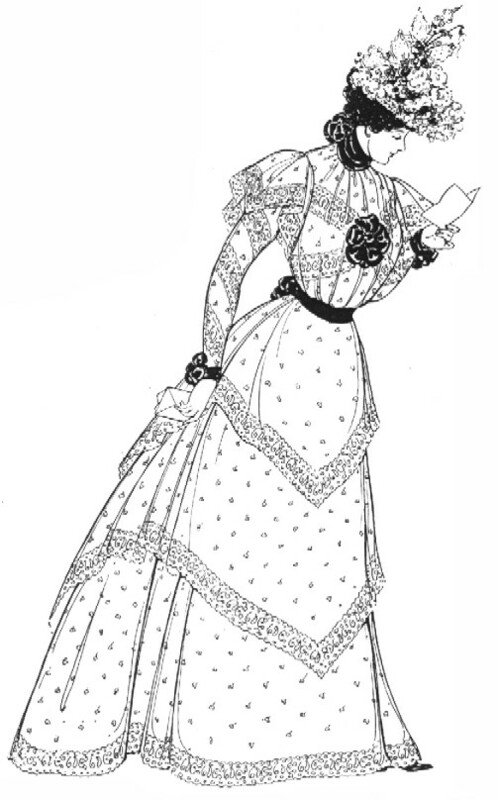 And that skirt is ULTRA Edwardian. :D Is it dated?